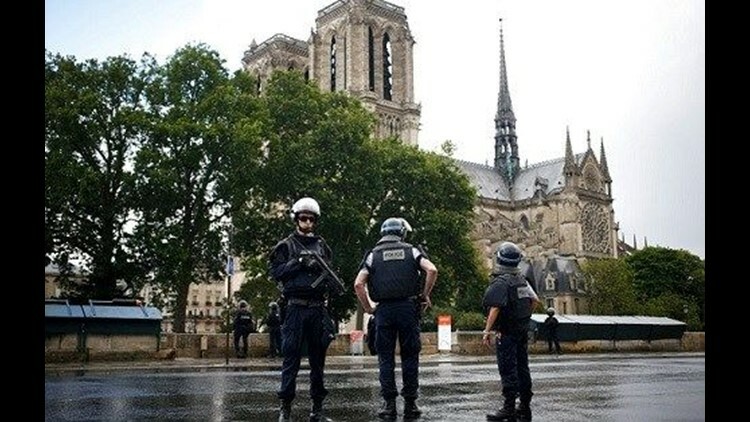 PARIS (AP) — Paris prosecutors have opened a counterterrorism investigation after an unidentified assailant attacked police with a hammer outside Notre Dame Cathedral. French Interior Minister Gerard Collomb says the attacker cried "it's for Syria" as he went after officers patrolling an esplanade in front of the famous landmark. The Paris prosecutor's office said the investigation was opened Tuesday soon after the attack. The attacker was shot and wounded in the incident in one of France's most popular tourist areas. It was the latest of several attacks in France targeting security officers. In April, an attacker opened fire on a police van on Paris' Champs Elysees, killing one and gravely wounding two others. The attacker was shot dead by police. A police spokesperson told The Associated Press that the officer used his weapon to shoot the attacker in Tuesday's incident. The spokesperson, who was not authorized to be publicly named, said the attacker was being hospitalized.